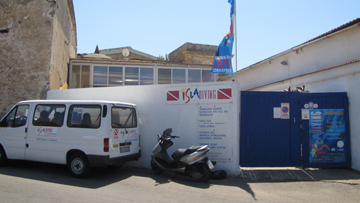 Our head office is in Carloforte on St. Peter&apos;s Island, on the south-west coast of Sardinia. The island can be reached by one hour's drive on the highway from Cagliari and a 30 minutes ferry trip from Portovesme (on the Sardinian coast) or Calasetta (Island of S. Antioco) with lines Delcomar. Cagliari Elmas Airport is accessible from all the main Italian and European airports within about 1 hour of flight and is served by several airlines including Alitalia and Ryanair. The port of Cagliari is connected to Civitavecchia, Naples, Palermo, Trapani by Tirrenia Navigazione. Our diving center can also be reached through different itineraries from those mentioned above, as for example the Barcelona-Porto Torres-Carloforte route. Once you step off the ferry in the port of Carloforte, turn left and continue along the coast for about 800 meters. Isla Diving will appear on the right, with its unmistakable blue door! For info and reservations view the Contacts page. 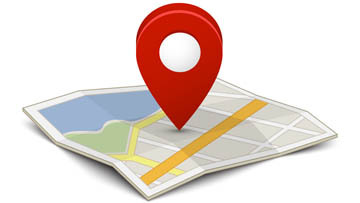 See all our services and see all contacts of private and collective TAXI for connection between AIRPORT/PORT of CAGLIARI and PORTOVESME in the Services page. To reach St. Peter's Island: Delcomar ferry lines from PORTOVESME (sardinia coast) e CALASETTA (St. Antioco Island). For our customers, on demand, we provide a shuttle service from the FERRY DOCK to the DIVING with our IslaBus!